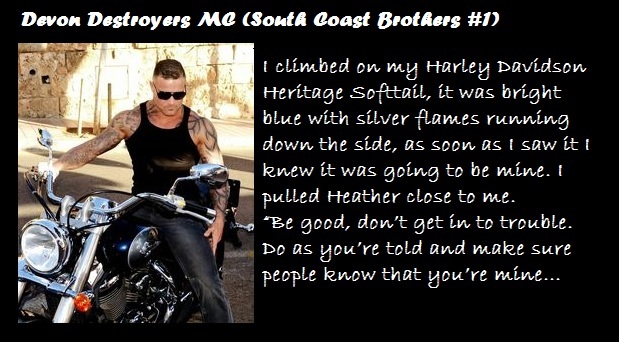 Heathers life drastically changed when her husband was murdered in front of her. 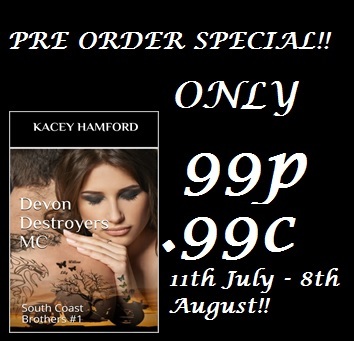 Forced to live and work at the Devon Destroyers MC to pay off her husband’s outstanding debt. Kacey is a pen name for two friends, Kelly and Claire. We started this journey together writing Rocking Esme in January 2014. We are avid readers and love all kinds of books. We were inspired to write a rock star book as that’s one of my (Kelly) favourite sorts of books to read. We joked about writing a book and then once we started it kind of just took off and we really love it. We both contributed to all of the Rocking books. Now Claire has taken a back seat due to work commitments and I wrote ‘Taking A Chance’ by myself and Claire was very much involved with the editing, reading and formatting. Now, I have written ‘Giving A Chance’ and had help from many of my friends with editing and beta reading. It still makes me so happy to see reviews and sales going up. I love writing and hope to do it as more of a full time job in the future.